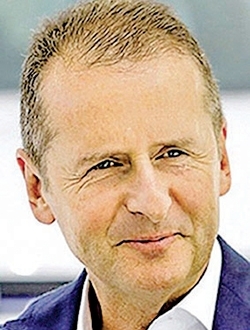 DETROIT — As Ford Motor Co. has tried to downplay its ongoing talks with Volkswagen Group, VW CEO Herbert Diess keeps upping the ante. Besides the potential for cooperating on commercial vehicles and sharing platforms for electric vehicles and pickups, Diess last week revealed that VW is eyeing access to Ford's U.S. manufacturing footprint, too. Since June, VW and Ford have been exploring a strategic alliance that could alter the global automotive landscape. Ford is looking to shed money-losing operations and streamline its work force, and sharing costs on redundant operations with VW would help speed that overhaul. VW, in turn, wants to increase its U.S. production and could use the help of an automaker well-versed in building the type of rugged SUVs and pickups that American buyers demand. After months of Ford demurring on any discussion of what the talks could produce, Diess' comments about using some Ford plants led Executive Chairman Bill Ford to acknowledge that something important might be budding. Ford said he didn't want to overstate the companies' progress but that the talks were going "really well." He added: "The culture fit is good." That's no small endorsement in an industry that has had all manner of alliances, partnerships and mergers collapse because the participants couldn't mesh. Ford, like many automakers, has been working to keep up with shifts in consumer behavior that threaten to upend the delicate balance between demand and manufacturing capacity. General Motors has too many underused plants, and Fiat Chrysler Automobiles is so maxed out that it might open Detroit's first new assembly plant in 27 years. Ford's phaseout of sedan production and shift to more light trucks has left it with some openings that VW could fill, but Diess' options are much more limited than they would be at GM. Most of Ford's U.S. plants are humming along at — and in some cases, over — ideal capacity. LMC Automotive says the automaker's North American utilization rate, including plants in Mexico and Canada, is at an impressive 81 percent. Shifts in consumer demand have made it harder for the Detroit 3 to keep their plants running efficiently. Ford could share some underused plants with VW, GM has too many car plants running inefficiently and FCA needs more capacity to make Jeeps. 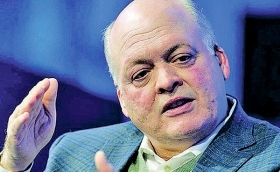 "We really manage that tightly," Ford CEO Jim Hackett told reporters last week. "I'm proud where we're at in our utilization right now." Both automakers declined to elaborate on Diess' comments, but factoring in what they have said about a potential tie-up, only three U.S. Ford plants — two in Michigan and one in Missouri — could realistically accommodate VW production. In June, the companies said their alliance would cover joint development of commercial vehicles for Europe. Diess later confirmed that VW was considering a global successor to its Amarok pickup based on Ford's Ranger, and Bloomberg has reported that the two may also collaborate on autonomous vehicles. All of those actions involve operations at Ford's plants in Michigan and Missouri. The likeliest candidate to be involved is Michigan Assembly, which is newly converted to build body-on-frame Ranger pickups and Bronco SUVs. Jeff Schuster, LMC's president of global forecasting, said the plant's 400,000-unit annual capacity would leave room for more product even after the Ranger ramps up and Bronco output begins. It also would fill a weakness in VW's U.S. lineup. VW's Chattanooga plant builds the unibody Atlas crossover and the Passat sedan. VW is debating whether to offer its U.S. dealerships a small body-on-frame pickup based on the Ranger or a unibody pickup that would closely follow the Tanoak concept unveiled in March. Diess in November told Automotive News that a unibody pickup in the U.S. was "probably still a bit risky," but that the final decision would be up to VW's new North American CEO, Scott Keogh. Ford's Flat Rock Assembly Plant in suburban Detroit could be another option. It's the sole global source of the Mustang and Lincoln Continental, but Ford is cutting output to one daily shift in the spring because of weak demand. Even on two shifts today, Flat Rock has a utilization rate of only 49 percent, according to LMC. New product is on the horizon for Flat Rock, however. The site is getting a $900 million investment to build Ford's commercial autonomous vehicle slated for 2021. If VW wanted to partner on self-driving vehicles, that work likely would happen in Flat Rock. The Kansas City Assembly Plant in Missouri, running at just 63 percent utilization, also would make sense. It builds the F-150 and Transit, two huge players in the commercial-vehicle market in which VW is interested. Ford idled its Transit line for two weeks in October in response to slower commercial orders. Questions about possible plant sharing remain. VW has plenty of room at its North American plants, which are running at 71 percent capacity. It's unclear how much volume VW is looking to add, as well as what workers it would use. Any agreement presumably would require approval from the UAW, which has been trying unsuccessfully to organize VW's Chattanooga plant. Diess made his comments during a visit to the White House to discuss the company's U.S. ambitions, as President Donald Trump presses for more investment in manufacturing here. "I think there's certainly some political posturing — 'Look at us. We love the U.S.' — so I think it was done very deliberately around that meeting," Schuster said. "But coming from a German company that probably needs to be careful with what it says and does right now, I would be shocked if that was said without some substance behind it."